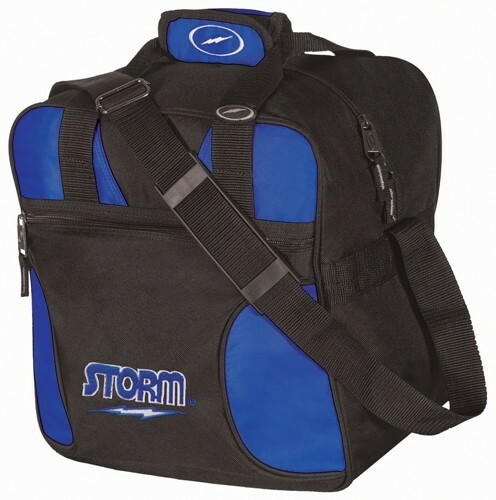 Check out this Black/Royal Storm Solo tote today! This bag holds one ball, a pair of shoes, and your accessories. It has an adjustable non-slip shoulder strap and is made with 600 Denier Polyvinyl fabric for durability. Great bag, holds my ball, size 11 shoes, towel, and grip bag. Comfortable to carry and it is also durable. Great buy. The ball pad it TOO THIN. When putting bag down you can here the ball hit the floor! Overall the size of compartments is great and fits everything I need. My only complaint is the foam in the bottom to hold your ball is kinda cheap. But for the price you can't really beat it. I have a size 12 shoes and they are EXTREMELY snug. Not sure if they are all like this but is a big downside for me as I bought this specifically to hold my shoes in the same bag as my ball. Due to the time it takes to produce the Storm Solo Single Tote Black/Royal ball it will ship in immediately. We cannot ship this ball outside the United States.